Refined Training integration allows for Adobe Connect meeting rooms to be created and/or accessed directly from the LMS when using the Connect Meeting activity to setup Adobe Connect meetings. This functionality allows for the ability to limit administrative access to Adobe Connect (AC) and control the creation of meetings based on the permissions assigned on the Refined Training platform and within Adobe Connect. In the Connect Meeting activity setup screen you can create a new meeting in Adobe Connect by adding an unique URL extension (custom URL) in the URL field, or by selecting "Generate" where the LMS will generate a random URL. When adding a custom URL, the system will perform a search and if it does not already exist, a new meeting room will be created in Adobe Connect with this URL. When generating a meeting URL, the system will generate a random URL for you following the required format for a meeting URL. Required format for Adobe Connect meeting URL: The URL must always start with a letter and allows for alpha numeric characters as well as hyphen and underscore. Down-slashes, question marks and other characters are not acceptable. Once saved, the new meeting will be added in Adobe Connect under Meetings >>> Shared Meetings >>> Moodle Rooms , depending on the sco-id used in your Global Connect settings. An Adobe Connect admin group will also be created automatically in Adobe Connect and added to the meeting permissions. Enrolled users in the course will be added to this group which gives them permission to access the meeting. Force these roles into the browser - For any roles selected (multiple roles are possible), the meeting room will open in a browser window, as opposed to the Adobe Connect add-in. Usually students have no need to use the add-in but anyone sharing their screen will be require to be in the add-in. This option appears when enabled at the system level. Meeting Dial-in Information - select one of your Audio Profiles from the drop-down menu to provide telephony inside your meeting room; you can also select None (the default). This can only be set for new meetings, if editing of this setting is required, it must be done from within the meeting room or directly in Adobe Connect. Meeting template - choose a template from the drop-down menu. When creating the meeting room template in Adobe Connect, the word "template" needs to be in the title for the option to show in the drop down in the LMS. Once the meeting is created the template can not be changed. Once the meeting is saved, the Telephony and Meeting template settings will be locked. Selecting Browse will cause a pop-up to display of all available URLs in Adobe Connect that you have permission to access. You can select from Shared Meetings or User Meetings and scroll to find the required room by Name and URL. RT NOTE: Depending upon the number of meeting rooms or the amount of content hosted on the Connect server, the option to browse may lag. Once the URL is validated, it can no longer be edited. Provided you have selected the option to Update date information in the site administration settings, updating Name, Date or Time in the LMS will also update the meeting in Adobe Connect upon saving. When reusing meeting rooms, leave the meeting room date in AC the same by opting not to update the date from the administrative setup option. A new option is to use the Recurring Meeting feature. Whichever way the room is left after one meeting is how it will appear whenever anyone returns to it. It is recommended to clear any unnecessary conversations or resources in the Adobe Connect meeting room after each use, if the room will be reused. The system will not let you generate a URL starting with a number. The generate tool doesn't allow leading numbers. If you attempt to override this and manually type in a URL with a leading zero, it will remove it and replace it with an "a". The system will also strip the URL of any special characters. Meeting Completion allows you to set the meeting conditions and control what happens once the meeting is complete. If you are issuing certificates as part of this completion routine the certificates must be created before the meeting is created. This is of greater importance when using the back up and restore functionality to ensure the settings are properly restored. Completion Delay – from the drop-down menu, select the amount of time after the start of the meeting that you wish to have the LMS run the completion criteria and pull the grades from Adobe Connect; this should be at least 15 minutes longer than the scheduled end of the meeting. Email attendance report to – email of the person to whom an Attendance Report will be sent; comma separated addresses allow for multiple recipients. Unenrol after attendance – select None, All, Attended or Absent to un-enrol users from the course. Issue to Attended – select the name of the certificate to be sent to those who attended, selected from the drop-down menu. You need to create the certificate inside the course beforehand. By sending the certificate by email to the users the certificate activity will be marked as complete when sent. Use the Iconic Display settings to specify how your meeting icon will display on the course page. Simply select the iconic configurations from the drop down menus or the check boxes. The option Display on course page, enabled by default at the site level, ensures that the icon displays on the course page. If you disable it for a particular meeting, the icon does not display on the course page but instead a link to the activity page displays. When the user clicks on the link, the icon that appears on the activity page will display according to the icon settings, such as size, position, extra text, etc. If you want a branded icon for the entire LMS, you can specify a site-wide custom icon in the Connect Meeting activity module settings. In addition to administrators, users who have been given the permission to edit Connect activities at the course level will be able to see the additional administrative options. Users who do not have the edit resource permission only have the ability to 'enter the Meeting Room'. Edit this Resource at Adobe Connect Central will take you directly to the meeting in Adobe Connect. View Meeting Attendees List (after the meeting has run) will display all the meeting attendees and the time spent in the session. This list will display in the timezone of the user viewing the report. Vantage Point Past Sessions will provide access to any Vantage Point session reports for that meeting room. Only applicable for meeting rooms using Vantage Point. You can enable your meeting to Link to Calendar Event which will create it as an event in the calendar, enabling Refined Reminders to be sent before and after the meeting. From the three drop-down menus you can select the timing of the reminder: Before, After, After Attending or After No-Show and which reminders are to be sent. Note: If you need more than the default three reminders, you can increase the default number in the Connect Meeting activity module settings. More information on creating custom reminders is available in the Creating Refined Reminders article. More information about how the front page or course calendar works is available at Calendar Event. For some meetings, you may want to capture more information other than whether or not the user simply accesses the activity. Detailed information about the length of time a user spent in a meeting is captured in Adobe Connect. To pull this data over to the Refined Training platform, the option Adobe Details must be selected using the drop-down menu in the he Grading Options. Adobe Connect captures and stores how many minutes each user spent inside the meeting room. After the Completion Delay, that you specified under Meeting Completion, has passed the LMS polls Connect to get information about meeting participation. RT TIP: The LMS polls AC only once per meeting, so make sure that the Completion Delay allows for everyone to have left the meeting room, especially if it is likely that the meeting will go over the scheduled time. Once the Completion Delay has passed, grades are reported to the Grader Report. If the lowest threshold is not reached, no grade is reported. In the example above, any attendance that is less than 30 minutes would not show a grade for the attendee in the Grader Report. If Vantage Point is being used in the meeting, attendee responsiveness is tracked by Adobe Connect using a feature of Vantage Point. 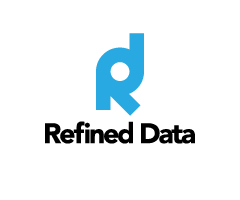 Responsiveness is measured by the number of times (expressed as a percentage) in a meeting that the attendees click on periodic screen messages to confirm that they are actively attending the meeting. The default interval for the prompts is 15 minutes and the variance is 10 - 15 %, randomized automatically by Vantage Point. Once the Vantage Point tracker is turned off, grades are reported to the grader report after two cron runs (a delay of up to 30 minutes). If any students fail to obtain a grade at or above the lowest threshold, no grade is reported for that student. In the example above, any responsiveness that is less than 80% of prompts would not show a grade for the attendee in the grader report. All grades that are 80% or higher will be reported as 100%. If the Vantage Point grades are reported before the meeting Completion Delay (set in the meeting completion section), the certificates will be automatically emailed to attendees who get 100% (as determined by the thresholds set). Allow a minimum completion delay of 30 minutes more than the meeting duration for this; for example, if the meeting duration is 01.00 hours, allow a completion delay of at least 01.30 hours. If you set all thresholds as None, the raw percentage results for all students will appear in the grader report, but the certificates will not be emailed automatically. The students need to come into the course and click on the certificate to obtain it. Speak to your Refined Specialist if you are interested in using Vantage Point in your meetings. The Recurring Meetings feature allows you to set up multiple meeting dates and times in the same meeting room or multiple rooms in the same course without having to reset the meeting after each event. In addition, the meeting completion feature allows you to send or receive an Attendance Report after each meeting, Unenrol participants based on their attendance and Issue a Certificate based on participants’ attendance. Set the new Start Date and Time. The URL and the duration will be carried forth from the original meeting. The instance of the activity cannot update the duration of the meeting. This is because when a meeting is originally created on the LMS there is a duration associated with that meeting, which is captured in Adobe Connect. Every instance after that will pull the duration from Adobe Connect. If the duration is updated on the LMS it will will not affect the meeting instance because when the page loads, the meeting information will again update from Adobe Connect. To change the duration, the duration update needs to occur in Adobe Connect. Then after the cache is updated, the duration updates. RT TIP: If you use a different URL for the meeting instance, you need to create the meeting in Adobe Connect first; you cannot create it when setting up the instance. 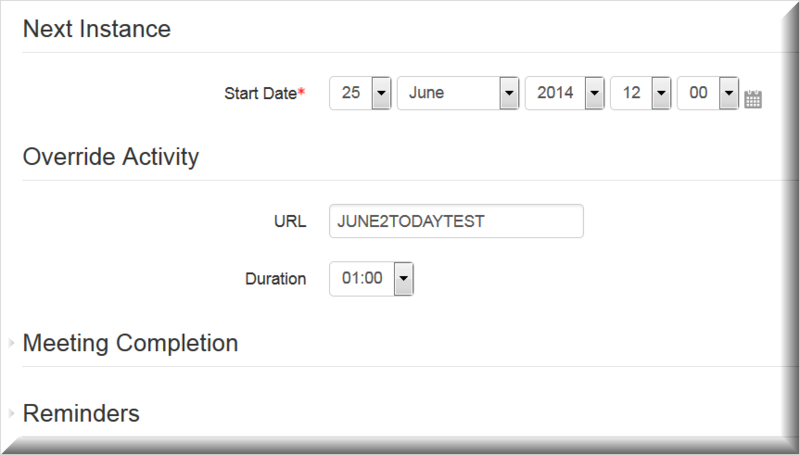 You can only add the new URL to the instance (in the Override Activity section). When the meeting finally updates to the override URL, the user group will be added to the meeting in Adobe, but not before that. In the course calendar, each instance of the meeting has its own entry. 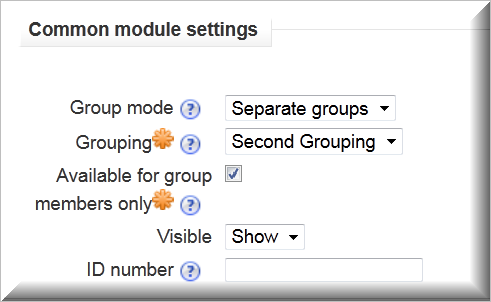 RT TIP: Since this feature is based on Groupings, an experimental feature of Moodle, if Moodle.org removes Groupings in future versions, this option will become obsolete. Next, create the Groups and Groupings, which organizes students so as to restrict the content they view. Students must be in a group in order to be in a grouping. Within the course, go to Settings>>> Users>>> Groups. On the groups screen, click on Create group. Give the group a name and save changes. Ensure the group name is highlighted on the left and click on Add/remove users. Click on users’ names and then on the Add button. You can use shift or control plus click to add several users at one time. Click on Back to groups. Repeat as needed to create all desired groups. On the groupings page, click on the people icon that represents Groups, found to the right of the Grouping name. Click on one or more Groups to add to the Grouping. Click on Back to groupings. You can add more groups to the grouping or students to the groups at a later time. Select Separate groups and the name of the Grouping (in the example above, Second Grouping only). Check off Available for group members only and under Visible, select Show. Click on Save and return to course. RT TIP: Only once Group mode and Grouping are enabled on the first meeting creation will the option to add a grouping to instances become available. When a user in the other grouping logs in, they will not see any meetings in the course until the previous meeting has completed and their meeting instance is next.